The phage-encoded protelomerase is essential for the conversion of the phage genome into the linear plasmid prophage. Regions on the N15 and PY54 genomes that are important for plasmid maintenance have been defined by the construction of replicative linear and circular miniplasmid derivatives (Hertwig et al. 2003a; Vostrov et al. 1992). It was demonstrated that for the replication of a circular miniplasmid, two phage-encoded loci are essential: (1) the reading frame of the replication initiation gene repA and (2) its origin located within the 3' portion of repA (Mardanov and Ravin 2006; Ziegelin et al. 2005). The latter publication provides data on the 212-bp origin of PY54 and shows that some structural elements of the ori sequence are also present in the proposed origins of N15 and ^KO2. Contrary to circular plasmids, linear plasmid replication requires the presence of the protelomerase gene and its target sequence. Ravin et al. (2001) showed that TelN and telRL constitute a functional unit acting on other replicons (F, P1) by conferring linearity on mini-F and mini-P plasmids. Moreover, the TelN/telRL system is also well suited to generate linear, closed mini-DNA with high stability in mammalian cells (Heinrich et al. 2002). two equal-length arms consistent with the generation of a single fork. 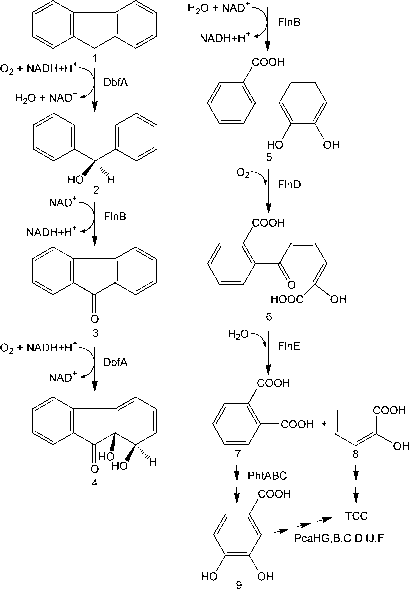 These molecules could result from TelN cleavage of the circle in type 2 molecules. Following the obtained data, Mardanov and Ravin (2006) suggested the following model of N15 plasmid replication (Fig. 9b). Replication is initiated at the origin located within repA, follows the 0 mode of DNA replication and proceeds bidirectionally. After duplication of telL, TelN processes this site creating hairpin ends and a Y-shaped structure is formed. After replication of the right telomere and subsequent cleavage, two linear molecules are produced. Under specific conditions, replication may precede end resolution and circular head-to-head dimers appear which then are processed by TelN. The analysis of the N15 genome sequence revealed a plausible promoter upstream from the protelomerase gene (Ravin et al. 2000). As shown in Fig. 10, this putative promoter is flanked by the L2 and L3 repeats. Thus, it can be assumed that the expression of the telN gene is subjected to TelN autoregulation. Dorokhov et al. (2003) studied the expression of the N15 sop operon that is located adjacent to the tel site (Fig. 2). The operon codes for two proteins (SopA and SopB) that are essential for the stable inheritance of the N15 plas-mid (Ravin and Lane 1999). While SopB interacts with four centromere-like sites (sopC) scattered on the N15 genome, SopA is a transcriptional repressor of the partition operon (Grigoriev and Lobocka 2001). It binds to a promoter (P1) that was identified in short distance to the sop operon (Dorokhov et al. 2003). Further upstream of the sopAB genes, several additional putative promoters have been identified. Their activity was investigated by Northern blot hybridization of RNA isolated from cells carrying transcriptional fusions of upstream fragments to lacZ on high copy-number plasmids and subsequent primer extension mapping. One strong promoter (P2) has been detected that flanks the R2 site (Fig. 10). This P2 promoter was tightly repressed by basic levels of TelN but was not sensitive to the action of SopA and SopB. It can be reasoned that P2 repression is the consequence of binding of TelN to the repetitive sequences and particularly to R2. 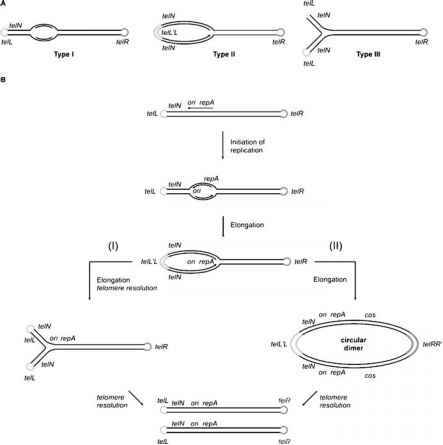 Hence TelN apparently exerts multiple functions: (1) it is responsible for the generation of the linear plasmid, (2) it cleaves intermediate products of linear plasmid replication at telRL, (3) it is a repressor for its own gene and (4) it is involved in the regulation of partitioning and therefore important for plasmid maintenance. Such different activities most likely require various protein domains. Fig. 10 DNA region between the N15 genes sopA and telN. The telomere resolution site telRL comprising telO and the repeats R1 and L1 is boxed. The boxes R3, R2, L2 and L3 show repeats belonging to the telomere occupancy site tos. P1sop is the promoter repressed by Sop. The promoters P2sop and P1 telN are repressed by TelN and are located close to the telRL binding site amino acid residues is mandatory. This region is also important for telomere resolution. The main catalytic domain is located around box C, which contains the essential tyrosine 424 (Fig. 3). Finally, the C-terminal region of TelN is responsible for the specific recognition of the telRL target. It can be expected that some additional domains exist, which are involved in the multiple functions of this interesting enzyme.